Overview: The good news is: you’ve been hired to supervise the construction of the new castle. The bad news is: due to a clerical error, you’re not the only one. And since there’s only one key to the city (purely ceremonial), the king has decided to just award it to the one who shows the most promise by winter. Welcome to Belfort . Who Will Like It? It’s a combination of worker placement, resource management, and building, so it’s a bit like Agricola but with a construction theme instead of harvesting. Players who enjoy those types of mechanics will probably like this one. The theme carries over into the graphic design of the game as well, which is colorful and cheery without being overly cutesy. There’s a board that holds the turn tracker, gnomes supply and the cards, and it’s made to look like a clipboard, with various flavor text that isn’t entirely necessary but is a nice feature. The rulebook itself is made to look like a heavy bound book, and has a good mix of humorous asides without getting in the way of, you know, actually learning how to play the game. All of the boards are nice sturdy cardboard, and all but the districts have rounded corners. The artwork is excellent and fairly easy to understand once you’ve started learning to play the game. 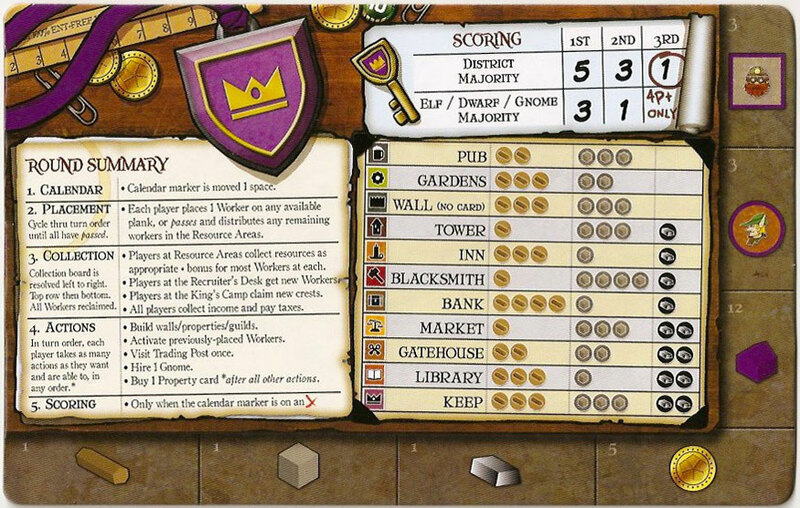 Belfort player board showing turn order, scoring, and building costs. Resources are organized along the edges. The game will take up a lot of space. For one thing, you’ll notice the player board above: it’s fairly big so you can have all the various information, but it may not have been entirely necessary. The idea is that you put all of your resources along the sides of the player board (not actually on it); it may have saved more space just to have a double-sided card and let everyone just pile their stuff in front of them, which is kind of what happens anyway. The cards are all good quality, and have simple, easy-to-read icons on them. One word about the wooden bits: It is pretty cool to have bits that look like wooden logs, stone blocks, and metal ingots (they’re even painted silver! ), but it turns out that little skinny logs and the trapezoidal ingots are kind of hard to pick up. They look awesome, but cubes might have been more practical. One nice touch: little plastic baggies were included for the bits. 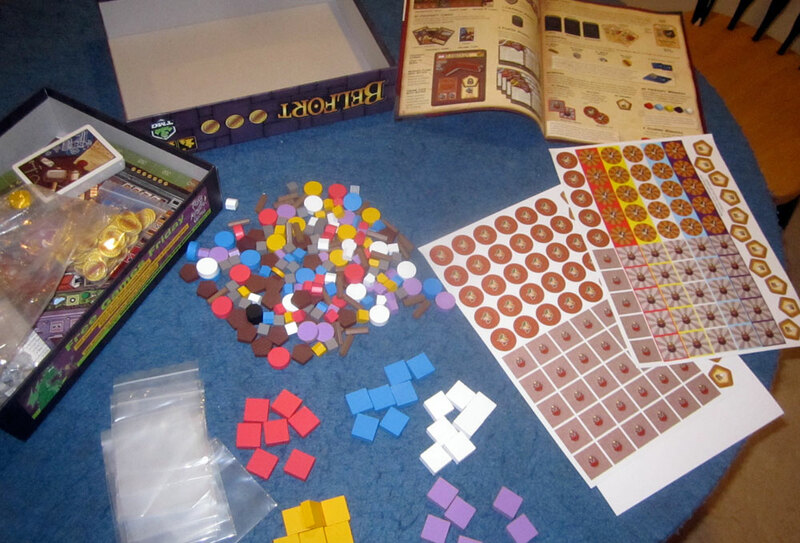 It’s great because you can keep things organized and make it easier to set up when you play. 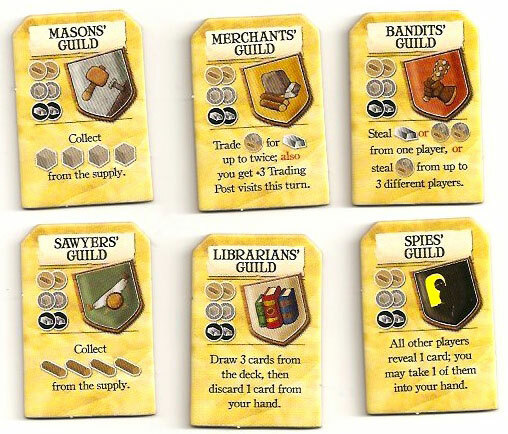 During each round, players take turn placing their elves and dwarves onto “planks” around the playing area: there are planks by each guild, on some of the building cards, and on the collection board. Putting a worker on a plank will allow you to take the associated action later in the game, which could be getting resources, recruiting more workers from the supply, drawing cards, and so on. There’s also a “King’s Camp” area which allows you to swap turn order crests with another player. Once there are no other planks you wish to use (or they’re all taken), then you send the rest of your workers to collect resources: elves can collect wood, dwarves can collect stone, an elf-dwarf team can collect metal, and any of them can collect gold coins. After everyone has placed all of their workers, the collection phase begins. A sampling of the property cards. Once that’s done, players use all of their actions by retrieving their workers from the planks and taking the corresponding actions. This is also where you can build properties by paying the resources from your own supply. Whenever you build a building, you put the card in front of you, and then place one of your property markers on the district boards. Each district has one of each type of building, so you have to choose where to build it. You can also hire gnomes (which go on the “locks” on the buildings to unlock those abilities or planks). You can visit the trading post once to sell and buy goods at a lower rate, and then once you’re all done you can choose to buy one property card. 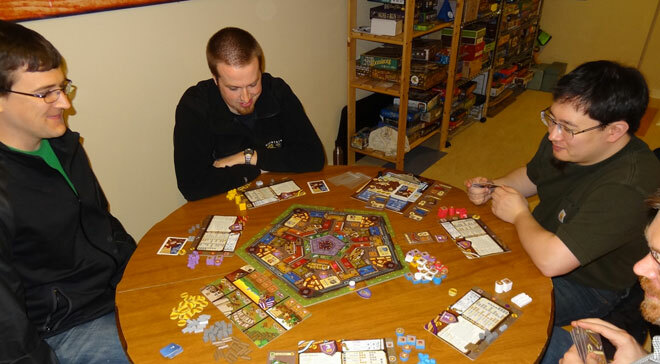 In a two-player game, there are some alternate rules, and each player will have limited control over a “Non-Player” that will compete for majorities in the districts. After the Actions phase, the NPs will each draw a card and place a property marker on that type of building. Scoring works as in a 4-player game. 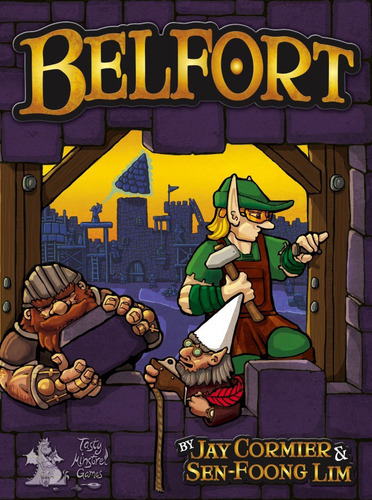 I like worker-placement games, so Belfort is a fun one for me. It does take a bit of explaining the first time you play it, and I noticed later that we still got a few rules wrong. It does ramp up nicely, though: at the beginning, when nobody has built anything yet, there simply aren’t very many places to send workers: basically to the guilds and to recruit more workers. So the placement phase goes fairly quickly, and most of the workers are just collecting resources. 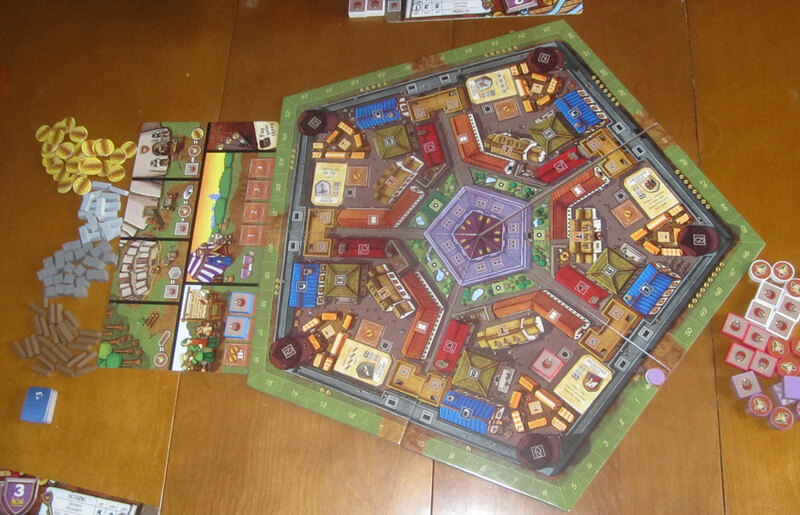 As the game progresses, though, and everyone has buildings and more workers, the turns get longer and longer. If you have somebody who suffers from analysis paralysis, this game will take forever. You take turns placing one worker each, but the Actions phase is done by each player all at once. That’s the part of the game that can feel sluggish, when you’re waiting for four other players to do all of their actions. Still, I think it’s definitely a game that allows for some interesting decisions, and it’s a matter of making the most of the actions available to you. Since each “plank” can only be occupied by one person, and each building can only be built once in each district, it’s a balance between taking what you need and taking what your opponent wants. Sometimes you have to build something less optimal simply because the district where you want to be is limited in what’s left. If you like worker-placement, this is certainly worth checking out. It’s fairly complex so I probably wouldn’t go much younger than the recommended “13 and up,” but for your older kids and adults Belfort can be a pretty intense competition.